The LG Ericsson LIP-8040L phone is the premium executive model in the LIP-8000 series IP range. It features state of the art design, a large screen, 10 feature keys and is an excellent choice for serious phone users. For detailed information about the LG LIP-8040L phone please read below. The LG LIP-8040L phone handset is the most unique phone in the new 'LG 8000 IP phone series' lineup. It doesn't offer the expensive colour screen or video option of the 'LIP-9070' or 'LIP-8050V phone' handsets and it does not offer the old fashioned paper usage that the 'LIP-8024D', 'LIP-8012D' and 'LIP-8004D phone' do. 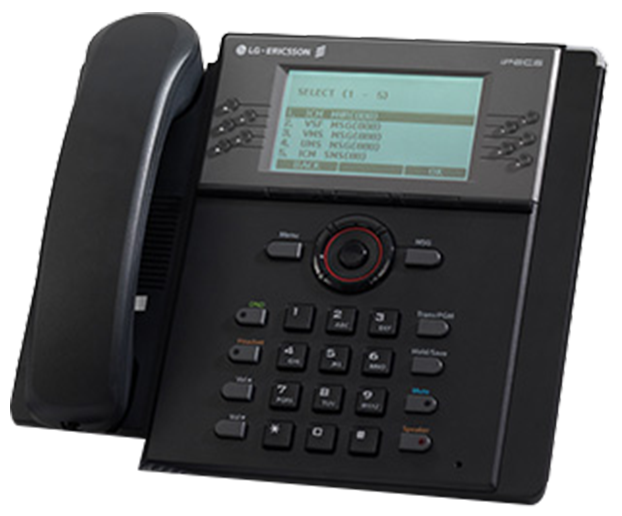 The LIP-8040L phone is more akin to a Cisco or Avaya handset with a large display and everything on the phone driven by soft keys. The great thing is it still offers the multi coloured LED lights next to the soft keys which many brands don't. This allows you to see exactly what is going on next to an on screen item by the colour of the LED being displayed. It makes everything easy to find at a quick glance. In the event you need extra buttons, you can always add 12 or 40 button DSS consoles with LED screens to provide this. They simply attach to the side of the LIP-8040L phone for plug and play operation. With gigabit connectivity the Ericsson LG LIP-8040L phone offers the type of speed that allows users to experience the highest voice quality and transfer rates. The LG LIP-8040L handset also offers full duplex HD quality speakerphone so you can talk hands free at the highest audio quality. As with all LG IP phones the LIP-8040L phone is able to connect anywhere that offers a LAN connection and supports the IEEE 802.11af Power-over-Ethernet standard so a separate power connection is not required. The phone is also intelligent with three context sensitive soft keys directly below the screen that provide options on screen depending on what you are doing (on a call, retrieving voicemail etc). For example, if you're on a phone call you might see options presented like transfer, conference or mute.However, if you then used voicemail retrieval the options would change to offer voicemail centric menu options like replay, delete etc. The handset is well conceived and all the main buttons are intelligently laid out and frequently used buttons like conference, voicemail, hold, mute, transfer, redial etc are readily locatable. The LG LIP-8040L phone is part of the 'LG Ericsson LIP 8000 series' which means they are compatible with the new 'LG iPECS' range (LG iPECS 50 phone system, LG iPECS 100, LG iPECS 300, LG iPECS 600 and 1200) as well as the 'LG Ericsson SBG-1000 phone system' for small business under 24 handsets. As a cheaper alternative for staff that may not need a premium handset you should also consider the cheaper ' LIP-8012D phone' - the most commonly deployed in companies.